A while ago I wrote a blog about the fly pictured above. I'd caught it in the unlikely act of blowing a bubble. Click on it to enlarge. (Click here to read that blog.) Although no one knows why flies blow bubbles, theories range from concentrating liquid food by evaporation, to aerating to reduce some kinds of microbial activity, to fly sickness, cleaning the mouthparts, cooling off by evaporation, and more. I thought I had been pretty lucky to take that photograph at just the right moment. Once in a lifetime, right? So imagine my surprise when I enlarged this photo, which I had taken casually and only because I didn't recognize the insect. 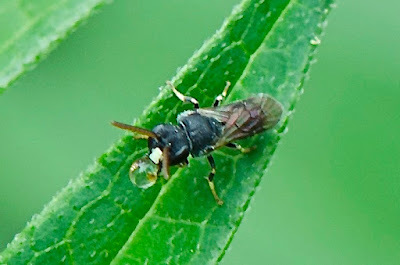 It turned out to be an invasive species of bee called a punctate masked bee, Hylaeus punctatus. The species has only recently been introduced to the United States. AND IT IS BLOWING A BUBBLE! I normally wouldn't use a picture this blurry in a blog, but a bee blowing a bubble trumps that for blog worthiness. And now, like a strict elementary school teacher with a classroom full of unruly gum-chewing kids, I'll be checking every insect I see for secret bubbles. The red milkweed beetle, Tetraopes tetrophthalmus. 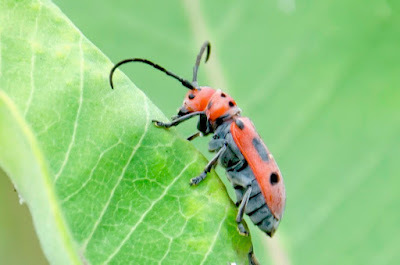 The red milkweed beetle is another nice summer insect. It's a longhorned beetle, in the family Cerambycidae. Check out its extreme antennae. 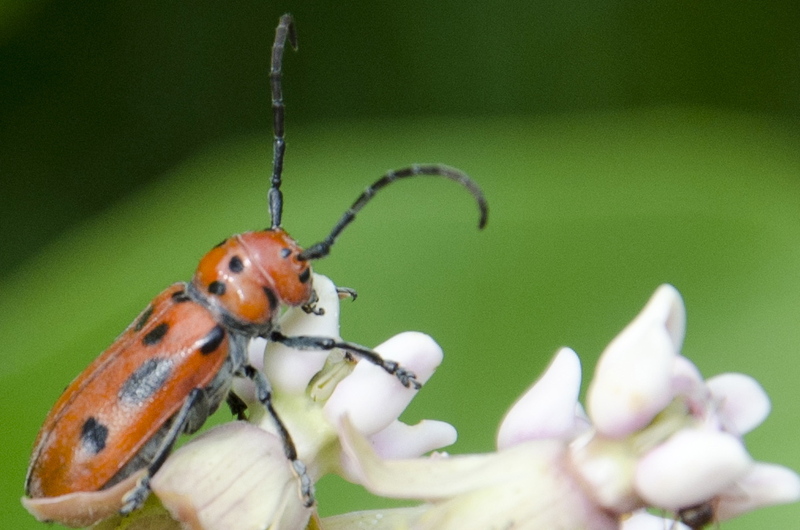 The red milkweed beetle's genus and species names are derived from Latin and mean four-eyed. Many species in the longhorned beetle family have antennae that originate close to the eyes, some so close that the eyes look indented. In the red milkweed beetle each compound eye is completely separated into two by the placement of the antennae and violà -- four eyes! Click to enlarge and check out the antenna with an eye on each side. Red milkweed beetles are among the few things that can eat the toxin-containing plants of the milkweed genus, Asclepias. They are able to store the toxins and end up unpalatable to potential predators, which they advertise with their showy colors. Red milkweed beetles are not the only red and black insects you can find on milkweeds. I've written about two others: large and small milkweed bugs. The red X on its back identifies this small milkweed bug, Lygaeus kalmii. The ones with a broad black band across the back are called large milkweed bugs, Oncopeltus fasciatus. You can read a blog I wrote previously about these bugs by clicking here. 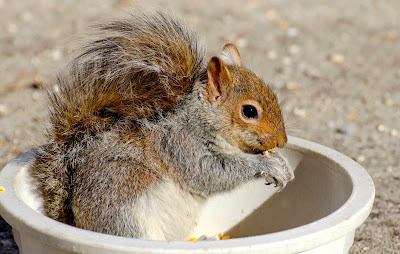 And another blog about both kinds by clicking here. Combined with monarch butterflies, that are also milkweed specialists in the caterpillar stage, red milkweed beetles and large and small milkweed bugs make for exciting times in the milkweed patch for insect enthusiasts. The summer azure butterfly, Celestrina neglecta. Click to enlarge. Note the handsome black and white striped antennae. 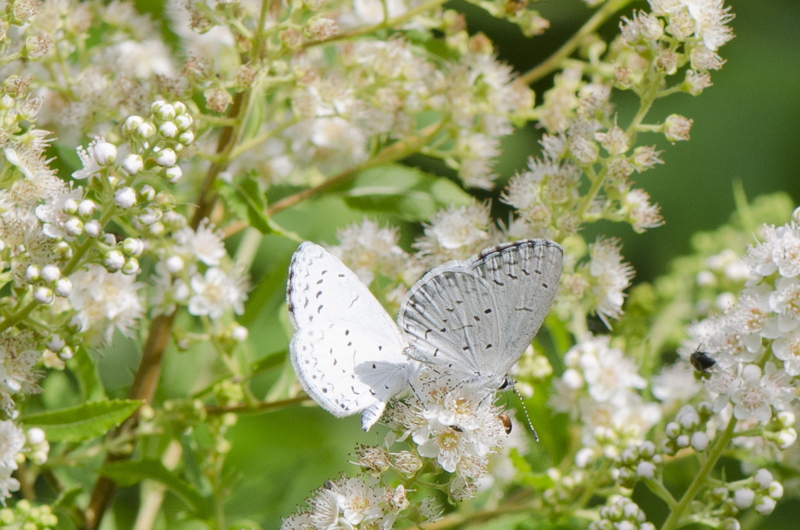 Summer azure butterflies are all over Brooklyn's flowers right now. The place is teeming with them. But they are small and often overlooked. Their wingspan is about an inch, so the one pictured above is just half an inch tall. They are white underneath and usually hold their wings closed over their backs. It is easy to mistake them for flower petals when they perch on blossoms. 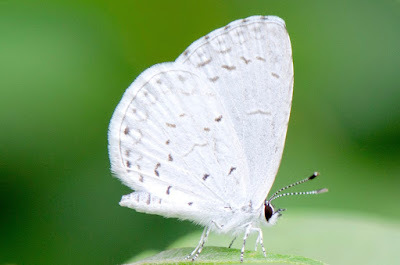 The upper surface of the wings is powdery blue. Summer azures are in the butterfly family Lycaenidae, famously studied by Vladimir Nabokov and commonly called "blues." Although I stood for an hour with my shutter poised, these little ones were too busy to linger with their wings open so I did not get a single shot of the blue surface. Like many other members of their butterfly family, summer azures spend their catterpillarhood in the company of helpful ants. The ants protect them by driving off hostile insects. The caterpillars in return produce a sweet substance from a nectary organ (on their backs) that the ants eat. It's rather like humans keeping cows for milk, except it's ants and caterpillars. Adult summer azures eat flower nectar. 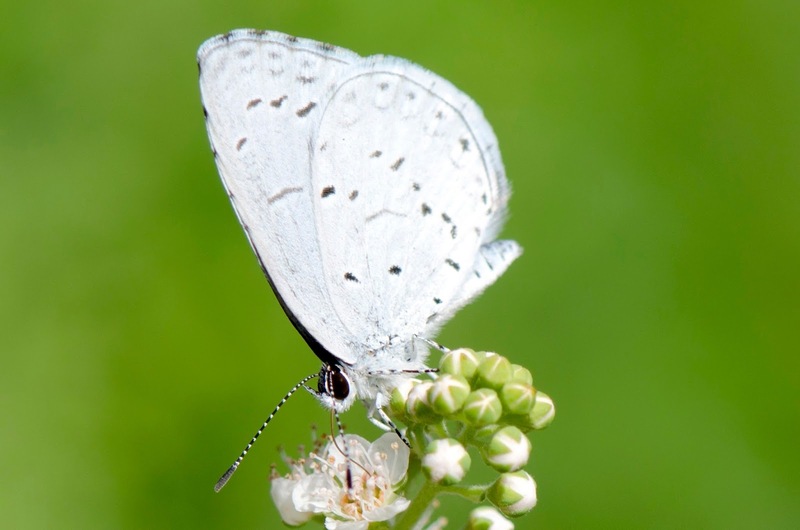 In this photo you can see the butterfly's long proboscis probing the flower blossom. Here is a poem I like that has a blue butterfly in it. Just a photo today. I'm rushing off to yet another summer barbecue.